When The Decemberists announced their new album I’ll Be Your Girl and released the synthy lead single “Severed,” they revealed that they were doing their own Traveler’s Rest festival in Missoula, MT again this year on August 4-5. 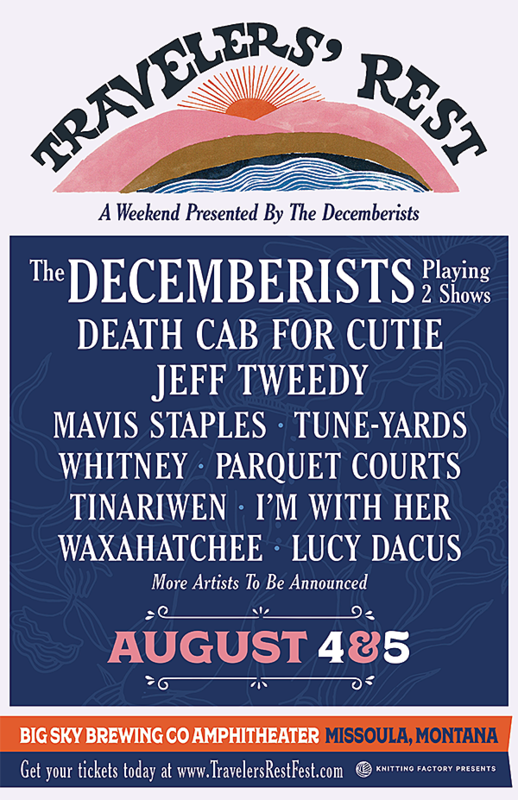 Now the initial lineup has been announced, and in addition to The Decemberists headlining both nights, it includes Death Cab For Cutie, Jeff Tweedy, Mavis Staples, Tune-Yards, Whitney, Parquet Courts, Tinariwen, I’m With Her, Waxahatchee and Lucy Dacus. Tickets are on sale now. Stay tuned for more acts TBA. The Decemberists’ tour also includes a big NYC show on June 13 in Prospect Park with M. Ward (tickets).